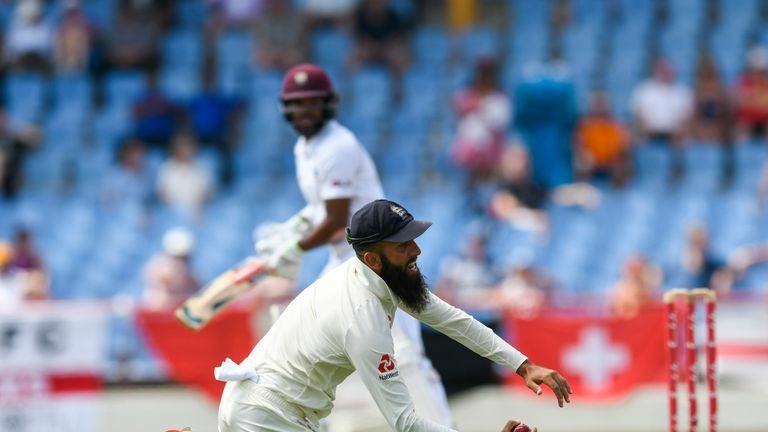 Moeen Ali claimed a sensational one-handed catch at gully to dismiss John Campbell during day four of the third Test between England and Windies at St Lucia. England had declared 5.2 overs into the morning session, on 361-5 with a lead of 484, after Joe Root was finally dismissed for a brilliant 122 when he flicked Shannon Gabriel to Shimron Hetmyer at short midwicket. Anderson then required just three deliveries to claim the wicket of Campbell, with Ali completing a stunning one-handed catch in the gully to dismiss the opener for a first ball! The visitors' premier bowler also accounted for Windies captain Kraigg Brathwaite (8) and Darren Bravo (0) as Windies collapsed to 10-3. What's on Sky Sports Cricket? Watch day four of the third Test between Windies and England, in St Lucia, live on Sky Sports Cricket.